Mayhem is set in the height of the Jack the Ripper murders, but body parts found at New Scotland Yard are definitely the work of a different killer, no matter how much the authorities wish it wasn’t. Thomas Bond is the police surgeon working on both cases, and as he delves into the murders he begins to suspect that something more supernatural than a rampaging serial killer is at work in London. Serial killers, Jack the Ripper, Victorian London, what’s not to like? 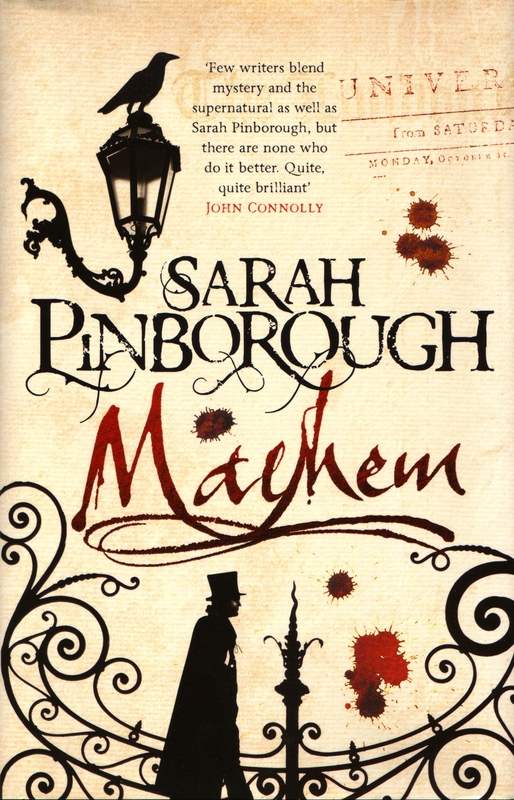 Plus although I had a couple of her e-books I hadn’t read any of Sarah Pinborough’s books and wanted to give her a try, partly due to the subject matter and partly because she is great fun to follow on Twitter (there’s that word again). I liked it a great deal. It was a very interesting experience reading it so soon after Drood (reviewed earlier) as there are some similarities in the use of the supernatural, the main character’s tendency to dabble in drugs, the mix of real and fictional characters and events. I thought this was much more successful; I liked Thomas Bond very much and found his struggle with opium and the effect it had on him much more sympathetic, as were the domestic elements in the story contrasting with the grimness of the crimes being investigated. But I don’t want to dwell too much on comparisons with someone else’s work, this is a really good novel. Recommended. I’m going to be searching out more of Sarah Pinborough’s work, although disappointed that the next volume in this series won’t be published until 2015. I really enjoyed this and await the next quite eagerly. If you want to read more SP you could try her fairy tale retellings, Poison is the first, followed by Charm and Beauty. They’re really good. They’re not for reading to your children! But I think you’d suspect as much if you follow this author on Twitter. There are unexpected twists and turns. Thanks Lynn, I had already loaded these three onto my Kindle app. Have heard only good things about them.